1650 Broadway @ 51st St.
Retro 1940s and 1950s theme diner is filled with nostalgic morabilia. Watch the best movies of the 1950s on an authentic 1956 Predicta televisions and "drive-in theatre" screen, meet your favorite "Miss Subways" in the gallery honoring the beauty queens of a bygone era. You can even wave to the conductor of the New York Central, NYC's largest indoor choo choo, as it circles around the mezzanine. 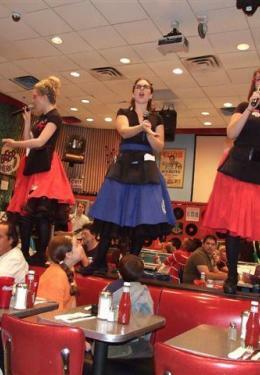 The unique diner also features singing waitstaff that's always lots of fun!